Jeanette Friedman and Philip Sieradski were honored by the Teaneck school board and the Department of New Jersey War Veterans last Wednesday at a board of education meeting at Teaneck High School. 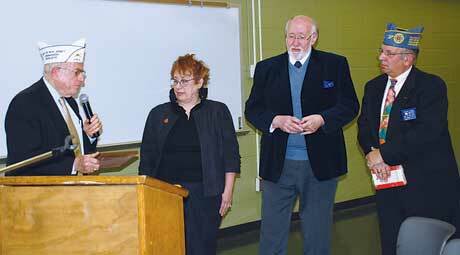 The New Milford couple were thanked for donating more than 250 books and DVDs, as well as artwork by Otto David Sherman, to the Teaneck High School Holocaust and Genocide Studies Center. The president of the School Board, Henry Pruitt, presented each of them with a Teaneck Apple pin. The Friedman-Sieradski Holocaust and Genocide Studies Library, created in honor of their parents, Peska and Wolvie Friedman and Daniel and Regina Sieradski, all Holocaust survivors, came from their personal collection. Department Cmdr. Bernard Epworth of Cherry Hill and Past Department Cmdr. Carl Singer of Passaic were on hand to present the Sieradskis with a plaque for community service as well. Friedman founded the first Second Generation group in the state in 1979 and served on the first Holocaust Education Commission in the nation, founded by then- Gov. Tom Kean. Sieradski, her husband, is commander of the local Jewish War Veterans post, and is also a past department commander. The two worked with Stephen Tencer and Pnina Kaplan to bring Holocaust education and commemoration to Bergen County and other counties in the state. The Sieradskis are consultants to the largest umbrella organization of Holocaust survivors in the country, The American Gathering of Jewish Holocaust Survivors and Their Descendants, and have published and edited numerous Holocaust survivor memoirs, as well as other books, at their publishing company, The Wordsmithy. In her remarks to the board, Friedman recalled the swastikas painted on Cong. Bnai Yeshurun 30 years ago as spurring her into action. Friedman said that her work with Ed Reynolds, one of the co-authors of the first Holocaust curriculum in the state and a teacher at Teaneck High, resulted, decades later, in the publication of her book “Why Should I Care?” Written with David Gold, it aims to teach students values and lessons learned from the Holocaust from a new perspective, one linked to the Internet.